Women, Adolescent girls and Children. Marley is a Paediatric and Women's Counsellor/Psychotherapist. Offering parent and child emotional support, strategies, empowerment and connection. Ignite Your Light Counselling is a private practice on a peaceful property in Torquay. working within Primary and Secondary schools across Melbourne and Geelong for many years. 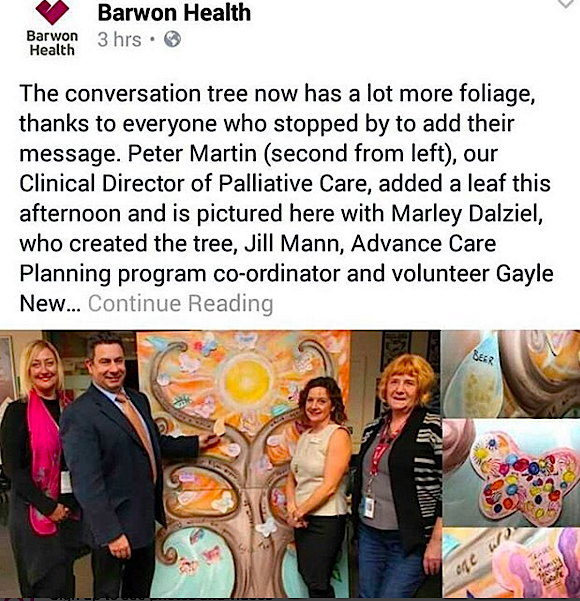 Community Palliative Care & the PCU working with Palliative Care Victoria. facilitating young women to graduate with a TAFE qualification. 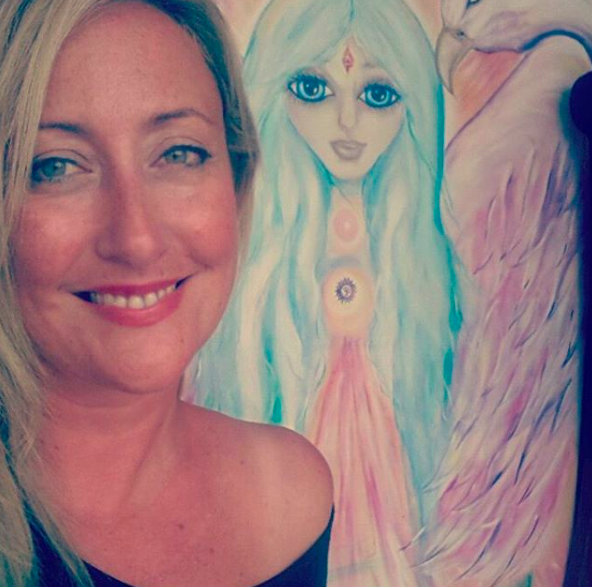 She is an International selling Artist, Children's book Author and Illustrator. OPTIONAL SOUL TREATMENTS CAN BE COMBINED IN THERAPY. Offering personalised confidential counselling combined with any of the below treatments. Psychomotor exercise, Emotional freedom therapy. ​ Relaxation head massage and Crystal face massage. ​​Who is the right Therapist for me ? * Counselling and supportive care of you as a whole person, not as a set of problems that needs fixing. * Your Peace of mind and motivation for healing and change during and after your therapy sessions..
​* A Strong counsellor/ client rapport and clear understanding of your personal situation and strengths is essential. * Counselling with respect and holistic soul centred care, guiding your self empowerment to heal from within. *​ Emotional Intelligence, empathy, human connection and compassion is imperative, enhancing your therapy outcomes. * A Therapist that you can authentically CONNECT with, who sees their work as a passion and privilege to be able to help YOU. * A holistic approach with a variety of therapies such as CBT, Psychodynamic therapy, Art therapy, Gestalt, Narrative, Transpersonal and Interpersonal therapy, Person centred and solution focused therapy. EAT,PRAY,LOVE Author Elizabeth Gilbert on her Australian book launch tour. With my daughter Maddy and I exchanging Books. To purchase Bella Butterfly go to the SHOP link. Some of my books to date. Please see my shop above for Art and Books sales. 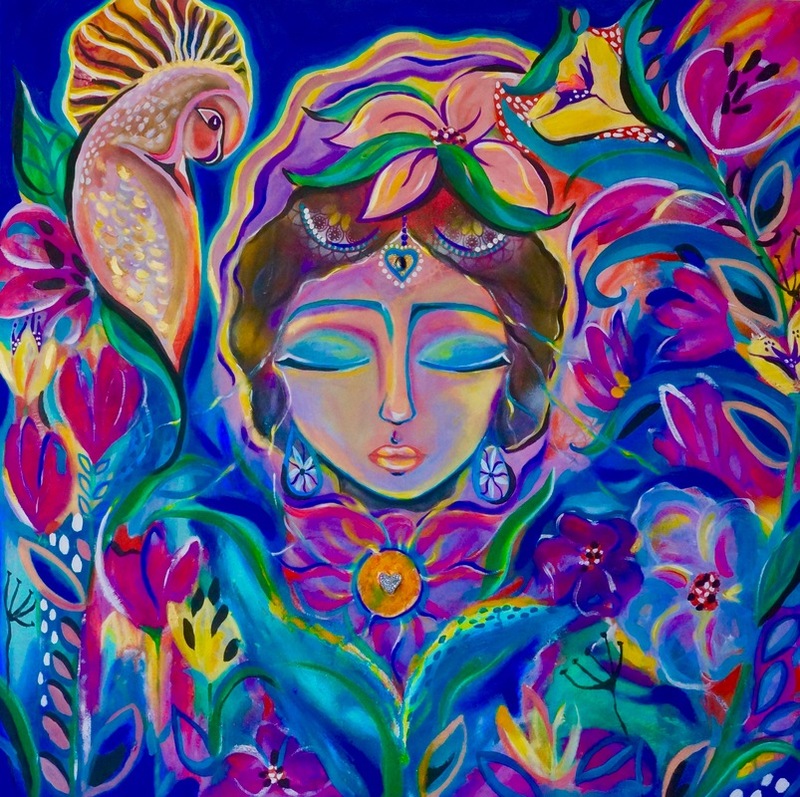 SOUL CONNECTIONS ART THERAPY GROUP~at YOUR WORK PLACE. 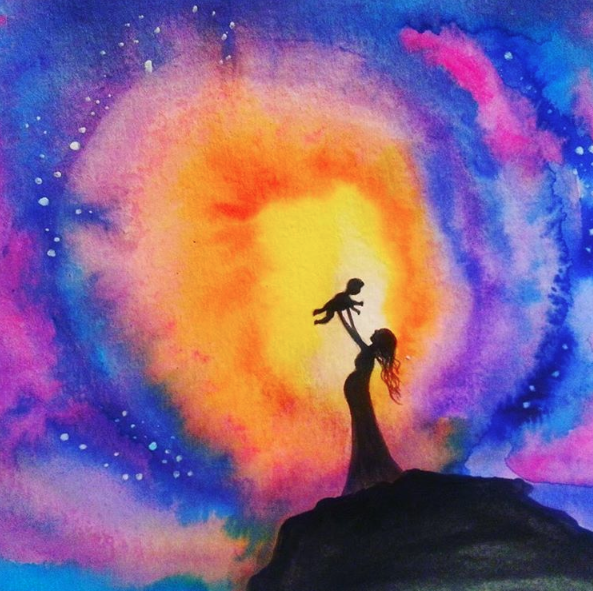 ​SOUL CONNECTIONS Art Therapy group at your work place..
(See Prices on the next page). I designed this workshop initially for Teenagers in schools or work group. It includes Transpersonal and Interpersonal Art Therapy. The session encourages AUTHENTIC inner SOUL CONNECTION to your self and others. Learn the Art of breaking down your walls and barriers for liberating authentic expression. Surf Coast Secondary College year 7 and 8 girls were involved again this year in the Soul Connections Art Therapy group we held for our Well being day. It was such a wonderful work shop, with the teens feeling confident and connected for greater self discovery,expression and growth. Corporate and Nursing staff also enjoyed their Soul Connections Art Therapy. The amazing Volunteers of Barwon Health created a large Canvas with the words.. "We are the heart of Barwon Health". 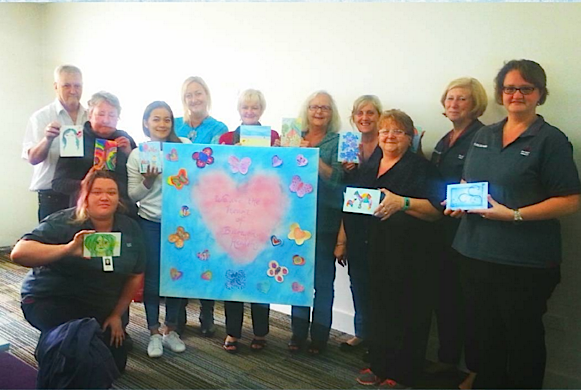 The ladies decorated their own little hearts and Butterflies and also produced their own little original canvas to hang in their office. A peaceful morning of Art Therapy combined with relaxation music, morning tea and ending in a meditation. Students, Palliative Care patients, Raise Foundation students, BUMP young mums, Carers, Staff and Volunteers have all enjoyed Soul Connections Art Therapy, creating some beautiful Art as gifts for family members. A perfect time to talk while enjoying some relaxation and self expression through Art. 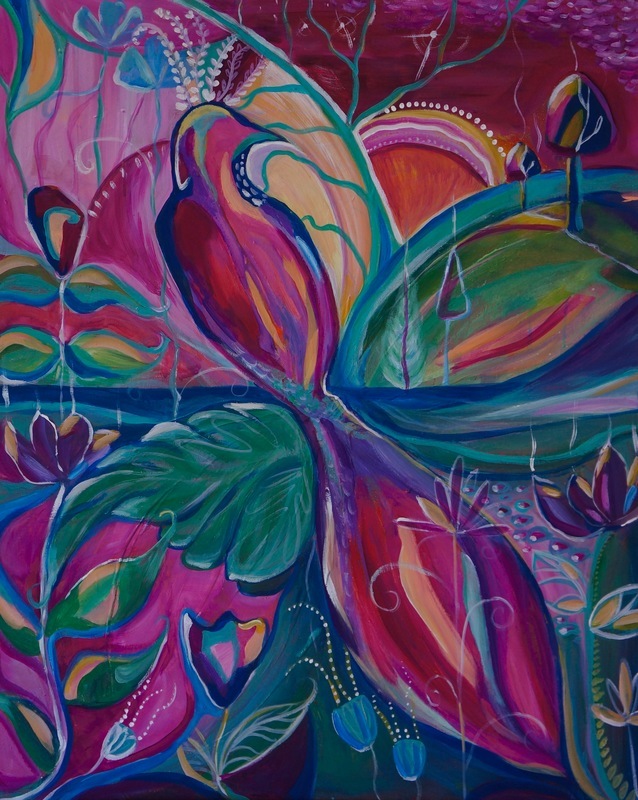 ​SOUL CONNECTIONS ART Therapy at your work place. Art Therapy working as Grief and Bereavement Counsellor in Palliative Care. Creating a discussion Tree. What a special way to get people talking and Creating together. My time in Palliative Care was so very special. Ignite your light in the Geelong Advertiser. "Marley, Thanks a million for yesterday. I bought a yoga Mat today and set up a small area for myself and Aidan. He chose himself a Mat also.I feel so much more relaxed." "Hi Marley, I can't tell you how much you helped me the last time I visited. I keep thinking about my shield/bubble around me. It works. I miss mum so much, but you helped me understand my grief and helped me ride my waves of sadness. Thank you with all my heart "
Hey Marley, I know we haven't spoken since I moved away to Melbourne, but i think its time I thanked you.You helped me a lot,even if it didn't seem like i was thankful back then, i really was. You helped me through a lot of crap and i honestly don't think Id be here today if it weren't for you, Mr R and Miss O'N. You helped me out of my shell and during a time of not having my own mother there you acted like one to me. I've wanted to say thank you for a while now, but Im not good with words much and i always get afraid of messaging people.But you helped me a lot and i always looked forward to seeing you at school. your hugs would always make me feel a lot better. Thank you for being there for me. It means a lot to me and still does. ​"I love your amazing art. Thanks for taking the time and drawing with me. I love my book so much". "Marley, thanks for always being there for me and for taking the time for me. I love you like a mum"
"Thank you so much for listening to me Marley and helping me through the toughest times. You are amazing and Im going to miss you so much"
​Words cannot describe how grateful and thankful I am. "Marley, you have shown me how to be happy again. You are very Loving and very caring and you always wear a smile on your face. When I was self harming, you shook me out of it with your love and care for me. You believed in me and helped me find Art to show my pain. Sometimes my mind can be my worst enemy. Thank you so much for helping me through it all. I will miss you when I finish school." I cannot Thank you enough for everything you have done for me. You have looked after me, nurtured me and have always been like a second mother to me. You have changed my life since day one. You have put a smile on my face at the hardest of times. You have been my guardian Angel. You have had a strong impact on my life. People like you are hard to find Marley. You have a heart of Gold and Im going to miss you. You have brought out the best in me and I really cannot thank you enough. Much Love "
"I felt like I was wrapped in a cocoon of Healing warmth and Love. What you have here is very special Marley." so blessed. Thank you Marley"
"Thank you Marley, Things could be worse.There is still a lot of good people and love in the world and you are one of them." Mr M.C~ R.I.P ~ Palliative Care Patient. "I love seeing you Marley, you bring sunshine to my room. You are my sunshine! Lets sing it together." Mrs I. E ~ R.I.P ~Palliative Care Patient. "Marley, are you my angel here to look after me and take me to heaven? You are so kind, Im not scared now." ​ R.I.P ~ Palliative Care Patient. "Thank you so much Marley, Mum loved you so much. We couldn't have got through this without you. You helped us understand our sadness and pain and we made it through." A.M ~Daughter of M.M~R.I.P ~ Palliative care Patient. "Marley, you are like the daughter I never had. There is something very special about you. I love seeing your smile each day, you make me feel so much better Marley.You have made my last weeks so wonderful. I will miss you so much. I love you." Mrs K.N ~ R.I.P ~Palliative Care Patient. I just wanted to Thank you for the other Night. I appreciate your Trust and Compassion. Yes, you made a difference." "Marley, your so funny, i laugh too much, your Bonkers. You know things could be worse Marley. But I can still see your smile, I can still laugh, Im still here, so i feel lucky". Mr M.C ~ R.I.P ~Palliative Care Patient. Thank you so very much for all of the healing and comfort that you have brought into our lives since dad passed away. You will never know how much your spiritual insight and counselling meant to us in a time of such profound and unrelenting grief! You truly are an earth angel ! "Marley, Thank you for being there through my hardest times. You listen with an open heart and make me feel calm again. You help me see the bigger picture to life and my situation that touches us all at some stage. I can't Thank you enough for helping me become my own hero as you say. You gave me the tools and now I use them when i feel my breathless panic attacks come on. They rarely happen now you showed me how to catch them before they consume me. You understood me from your experiences and helped me through my grief and deep heart ache. Love to you and many Thanks again. Thank you for helping me this year at school. Thank you for the hilarious times we had and Thank you for being there for me this year when i needed it most. Merry Christmas and Happy new year." Thank you so much for all the help you have given my daughter this year. She is now smiling and happy again thanks to your support and care. Wishing you a very Happy Christmas and safe holidays." "Marley we are so lucky to have you. Thank you so much for helping Grace paint her picture." Mrs Sharon Harris ~ Mother and Secondary Teacher. "Good morning beautiful you. Just saying you really are the most amazing person i know. Seeing your Instagram page makes me so happy and proud of you. I leave Anam cara house today but its been so peaceful and beautiful. You are a real inspiration and Im lucky you came into my life Marley. Thank you for being you, Stay beautiful, stay real xo Love you gorgeous one." "Thank you for the wonderful session last night. Yes, I slept so well, thank you.I look forward to the next one and also taking whatever comes our way as a moment to cherish and every day as a gift. Love and Light." 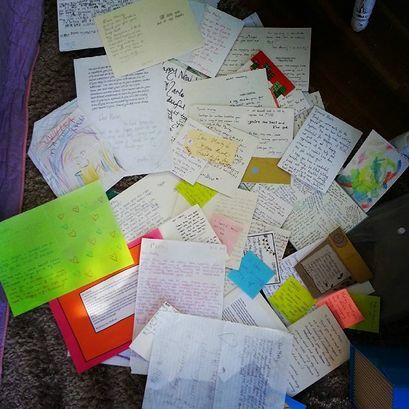 The many beautiful cards and letters of Thanks I receive from patients, staff, clients and students. A proud moment for my BUMP young mothers group from the Raise Foundation creating their own dream boards and dream catchers. MORE BEAUTIFUL TESTIMONIAL MESSAGES and LETTERS ABOVE RECEIVED From Patients, Children, Students, Parents, Staff and Clients. "I do have faith. I know you must be an angel. I'd be alone if it weren't for you. My family is so far away and my sons on the way. Thank you for being here with me Marley"
Mr P.G ~ R.I.P ~ Palliative Care patient. "Marley what you do to make our kids feel special is amazing. Everyone of the kids is richer for having you around"
"Marley, your inner glow is infectious and you make others feel special, but you are very special"
"Marley, You are So Zen…such an amazing energy"
"Dearest Marley, many many Thanks to you. After my healing you stayed in my head for days. Your Kindness, Gentleness and Love made such an Impression. I feel so positive and amazing. Great to see you again. " "Dear Marley, Thank you for our beautiful books. We love them so much. We loved painting with you. Love Inara and Annika." "Thank you so much Marley, I kept thinking of your words. Mum is so happy she can talk to you and that you are here with her at this very challenging time. Thanks for being here for us." S.M ~Carer~ Daughter of a Palliative Patient. overwhelmingly positive, supportive, creative and Caring. What a truly remarkable person you are. I am continually amazed at your generosity and concern for all our kids at SCSC. ​You never let a day go buy where you don't spread a pure sense of support and care for those around you. ​You contribute so much to our school. It is these qualities that make you so valuable to our team. " Scott Diamond~ Principal Surf Coast Secondary. "Marley, To have some one as special as you in my life makes life so much brighter"
"Dear Marley, we want to say Thank you for caring. ​Without you and your support we wouldn't be the people we are today. Even still on this earth Marley. You truly are an Angel and filled with wisdom. You have shared this love and wisdom to all those you have come across, and we are very appreciative and grateful to have you in our lives. You are an inspiration to everyone, making people believe in themselves again.You inspire people to become better people, to express their inner selves and believe in the world. Thank you again you beautiful soul. Lots of Love"
"Marley Thanks for doing Reiki with me. I really loved that. I love seeing you Marley. You make me smile each day." Mr B.K. ~R.I.P ~Palliative Care Patient. ​"Thanks for believing in me Marley and teaching me to believe in myself again." ​Jen. H ~ Melbourne Marketing Exec. "Thank you so much Marley, for being my constant sounding board. Sometimes I get so over whelmed and you come in and calm me down. Make it all peaceful again. It really is moment by moment, Day by Day." Mrs F.G ~Wife and Carer of a Palliative Care Patient. "Marley, Thank you for being here. I remember you being by side, holding my hand and feeling calm again. There's something so special about you"
​Mrs B.H ~ R.I.P ~Palliative care Patient. "Marley, you have brought some beautiful light to Palliative Care. ​We don't want you to leave" Palliative Care Nurse. ​"No, you don't understand what you did for us that night Marley. You helped us in such a profound way. You don't know how appreciative we are. Mum and I are so blessed you stayed with us so late that night, we are so thankful". Mrs J.H & Mrs G.W Daughter ~ Palliative Care Familiy. "Marley, I havent forgotten you. You took me to the doctors after that terrible accident. I remember you sitting with me, talking to me, i was like a zombie then in shock. When I felt the worst and wanted to end it or take a stack of drugs, you made me see its not worth it. You said Im better than that. You said Im stronger than that and I believed you cos I am.I lost my best mate and you said he'd want me to life again. So, I never did those drugs and now I have a good job and life. Thanks for all our talks and you always believed in me, I remember that. " ​ J.B ~ Past Male Student. "Thanks Marley, I want you to know Im off all the drugs now. I don't do anything stupid anymore. I got a good job and Im working with dad now. Im gonna do good in my life. You always believed in me and told me Im a leader. One day I might work with troubled kids so I can help them get through the stuff I have been through with drugs.Thanks heaps Marley for never judging me and supporting me." K.D ~ Past male Student. "I just want you to know how wonderful i felt after my session with you. My head feels clear, my heart more full and i had tears of release from so much stress at work and also childhood pain. Thanks for your wisdom and personal care. I can tell you love what you do and you do it so well. You helped me disconnect from all the internal and external noise. Ive even got my husband meditating now, so thats saying something. I look forward to my next session with you. So many thanks." Some days my anxiety was reaching debilitating levels at work. Thank you for teaching me how to centre myself. 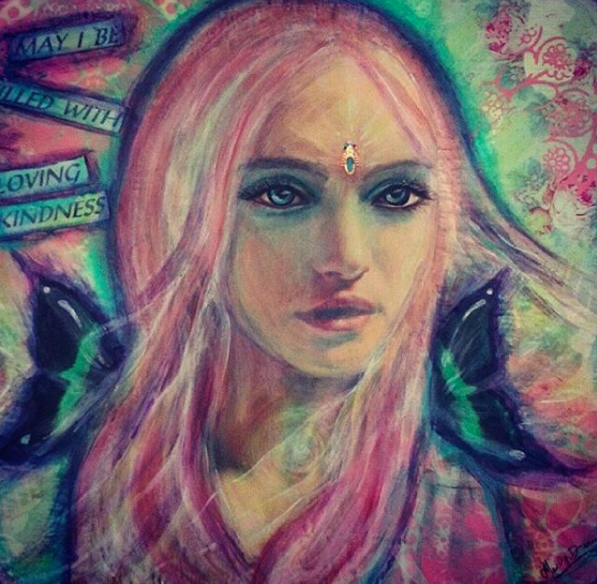 I love my Reiki girl picture, its on my fridge. Whenever i feel stressed i go to her and re centre with my breathing saying what you have taught me. Can't Thank you enough for helping my Monkey Mind. I love your little studio Monkey." "Thank you so much Marley, I have been telling my mum all about it and how divine you are! It was so lovely meeting you, Im so glad I have met you! Im looking forward to next week." Dear Marley, i'm so glad i flew over from Tasmania after my sister Belle recommended i see you. After our first session i want you to know I went for a walk and found a quiet spot by the water, and with the help of your beautiful art work and my new treasured clear quartz necklace, i just attempted my first meditation.I want to thank you so much for helping me find that.As you know its all new to me and i want to learn more and have ordered the book you recommended. i am extremely sentimental and i absolutely love my beautiful necklace you made. I will treasure it forever.I appreciate your time and feel i have more strength now to make this turning point in my life. Thank you from the bottom of my heart.